Having a great July 4th? The day gives us another cause to celebrate, as the Earth reaches aphelion today, or our farthest point to our host star. Aphelion is the opposite of the closest point of the year, known as perihelion. Note that the ‘helion’ part only applies to things in solar orbit, perigee/apogee for orbit ’round the Earth, apolune/perilune for orbit around the Moon, and so on. You’ll hear the words apijove and perijove bandied about this week a bit, as NASA’s Juno spacecraft enters orbit around Jupiter tonight. And there are crazier and even more obscure counterparts out there, such as peribothron and apobothron (orbiting a black hole) and apastron/periastron (orbiting a star other than our Sun). And finally, there’s the one-size fits all generic periapsis and apoapsis, good for all occasions and ending pedantic arguments. In the 21st century, aphelion for the Earth can actually fall anywhere from July 2nd to the 7th. The once every four year leap day is the primary driver in this oscillation, and the exclusion of a century leap day in 2100 — the first such exclusion since 1900 — will reset things even farther astray. Aphelion versus perihelion. (orbits exaggerated). Image credit: NOAA/NASA. In 2016, the Moon reaches New on July 4th at 11:01 Universal Time (UT) just over five hours prior to aphelion, marking the start of lunation 1157. The sighting of the waxing crescent Moon also marks the end of the Muslim fasting month of Ramadan. Earth reaches aphelion at 16:24 UT today, 1.0168 AU from the Sun. This year’s close occurrence of aphelion versus a New Moon won’t get topped until 2054, with an aphelion versus New Moon just 5 hours 6 minutes apart. The 2016 coincidence is also the closest since the start of the 21st century. Fun fact: we’re headed towards an aphelion maximum just 6,590 kilometers off of the mean on July 4th, 2019, the widest for the 21st century. Mean distance from the Sun at aphelion is 1.0167 AU (152,097,701 km). Aphelion for the Earth can range over a variation of 21,225 kilometers for the 21st century. It’s a happy circumstance that Earth reaches aphelion in our current epoch in the midst of northern hemisphere summer, and just a few weeks after the June solstice. The eccentricity of the Earth’s orbit actually varies from near-circular to 0.0679 and back over the span of 413,000 years. In our current epoch, the eccentricity of our orbit is 0.017 and decreasing. Add this variation to changes in the axial tilt of our planet and orbital obliquity, and you have what are known as Milankovitch Cycles. One only has to look at Mars’s wacky orbit with an eccentricity of 0.0934 to see what a difference it makes. Ironically, Mars reaches perihelion in October 29th, 2016, and will make a very close pass near next opposition pass in 2018. The Sun as seen from the Earth: perihelion vs aphelion. The red circles are the size of the opposing solar disk transposed on the other. Image credit: Dave Dickinson. Aphelion means a smaller apparent Sun, a good target for a total solar eclipse. Stick around until July 2nd, 2019 and you’ll see just that, as a total solar eclipse occurs near aphelion for South America and the southern Pacific at 4 minutes and 33 seconds in central duration. Aphelion versus perihelion 2008. Image credit and copyright: Alex Conu. This month also sees another special treat, as all classical planets enter the evening sky. More to come on that soon. For now, happy 4th of July, and merry aphelion! A spectacular display of celestial fireworks like none ever witnessed before, burst forth from Rosetta’s comet right on time – commemorating the Europeans spacecraft’s history making perihelion passage after a year long wait of mounting excitement and breathtaking science. As the European Space Agency’s (ESA’s) Rosetta marked its closest approach to the Sun (perihelion) at exactly 02:03 GMT on Thursday, August 13, 2015, while orbiting Comet 67P/Churyumov–Gerasimenko, its suite of 11 state-of-the-art science instruments, cameras and spectrometers were trained on the utterly bizarre bi-lobed body to capture every facet of the comet’s nature and environment for analysis by the gushing science teams. And the perihelion passage did not disappoint – living up to its advance billing by spewing forth an unmatched display of otherworldly outbursts of gas jets and dust particles due to surface heating from the warming effects of the sun as the comet edged ever closer, coming within 186 million kilometers of mighty Sol. ESA has released a brand new series of images, shown above and below, documenting sparks flying – as seen by Rosetta’s OSIRIS narrow-angle camera and NAVCAM wider angle cameras on August 12 and 13 – just a few hours before the rubby ducky shaped comet reached perihelion along its 6.5-year orbit around the sun. Indeed the navcam camera image below was taken just an hour before the moment of perihelion, at 01:04 GMT, from a distance of around 327 kilometers! Frozen ices are seen blasting away from the comet in a hail of gas and dust particles as rising solar radiation heats the nucleus and fortifies the comet’s atmosphere, or coma, and its tail. After a decade long chase of over 6.4 billion kilometers (4 Billion miles), ESA’s Rosetta spacecraft arrived at the pockmarked Comet 67P/Churyumov-Gerasimenko exactly a year ago on Aug. 6, 2014 for history’s first ever attempt to orbit a comet for long term study. In the interim, Rosetta also deployed the piggybacked Philae lander for history’s first landing on a comet on Nov. 12, 2014. In fact, measurements from Rosetta’s science instruments confirm the comet is belching a thousand times more water vapor today than was observed during Rosetta’s arrival a year ago. It’s spewing some 300 kg of water vapour every second now, compared to just 300 g per second upon arrival. That equates to two bathtubs per second now in Aug. 2015 vs. two small glasses of water per second in Aug. 2014. Besides gas, 1000 kg of dust per second is simultaneously erupting from the nucleus, “creating dangerous working conditions for Rosetta,” says ESA. “In recent days, we have been forced to move even further away from the comet. We’re currently at a distance of between 325 km and 340 km this week, in a region where Rosetta’s startrackers can operate without being confused by excessive dust levels – without them working properly, Rosetta can’t position itself in space,” comments Sylvain Lodiot, ESA’s spacecraft operations manager, in an ESA statement. Here’s an OSIRIS image taken just hours prior to perihelion, that’s included in the lead animation of this story. The period of the comet’s peak intensity, as seen in all these images, is expected to continue past perihelion for several weeks at least and fulfils the dreams of a scientific goldmine for all the research teams and hundreds of researchers involved with Rosetta and Philae. And Rosetta still has lots of fuel, and just as important – funding – to plus up its ground breaking science discoveries. ESA recently granted Rosetta a 9 month mission extension to continue its research activities as well as having been given the chance to accomplish one final and daring historic challenge. Engineers will attempt to boldly go and land the probe on the undulating surface of the comet. Officials with the European Space Agency (ESA) gave the “GO” on June 23 saying “The adventure continues” for Rosetta to march forward with mission operations until the end of September 2016. If all continues to go well “the spacecraft will most likely be landed on the surface of Comet 67P/Churyumov-Gerasimenko” said ESA. How Long Does It Take to Get to Pluto? It’s a long way out to the dwarf planet Pluto. So, just how fast could we get there? Pluto, the Dwarf planet, is an incomprehensibly long distance away. Seriously, it’s currently more than 5 billion kilometers away from Earth. It challenges the imagination that anyone could ever travel that kind of distance, and yet, NASA’s New Horizons has been making the journey, and it’s going to arrive there July, 2015. You may have just heard about this news. And I promise you, when New Horizons makes its close encounter, it’s going to be everywhere. So let me give you the advanced knowledge on just how amazing this journey is, and what it would take to cross this enormous gulf in the Solar System. Pluto travels on a highly elliptical orbit around the Sun. At its closest point, known as “perihelion”, Pluto is only 4.4 billion kilometers out. That’s nearly 30 AU, or 30 times the distance from the Earth to the Sun. Pluto last reached this point on September 5th, 1989. At its most distant point, known as “aphelion”, Pluto reaches a distance of 7.3 billion kilometers, or 49 AU. This will happen on August 23, 2113. I know, these numbers seem incomprehensible and lose their meaning. So let me give you some context. Light itself takes 4.6 hours to travel from the Earth to Pluto. If you wanted to send a signal to Pluto, it would take 4.6 hours for your transmission to reach Pluto, and then an additional 4.6 hours for their message to return to us. Let’s talk spacecraft. When New Horizons blasted off from Earth, it was going 58,000 km/h. Just for comparison, astronauts in orbit are merely jaunting along at 28,000 km/h. That’s its speed going away from the Earth. When you add up the speed of the Earth, New Horizons was moving away from the Sun at a blistering 160,000 km/h. Unfortunately, the pull of gravity from the Sun slowed New Horizons down. By the time it reached Jupiter, it was only going 68,000 km/h. It was able to steal a little velocity from Jupiter and crank its speed back up to 83,000 km/h. When it finally reaches Pluto, it’ll be going about 50,000 km/h. So how long did this journey take? New Horizons launched on January 19, 2006, and it’ll reach Pluto on July 14, 2015. Do a little math and you’ll find that it has taken 9 years, 5 months and 25 days. The Voyager spacecraft did the distance between Earth and Pluto in about 12.5 years, although, neither spacecraft actually flew past Pluto. And the Pioneer spacecraft completed the journey in about 11 years. Could you get to Pluto faster? Absolutely. With a more powerful rocket, and a lighter spacecraft payload, you could definitely shave down the flight time. But there are a couple of problems. Rockets are expensive, coincidentally bigger rockets are super expensive. The other problem is that getting to Pluto faster means that it’s harder to do any kind of science once you reach the dwarf planet. 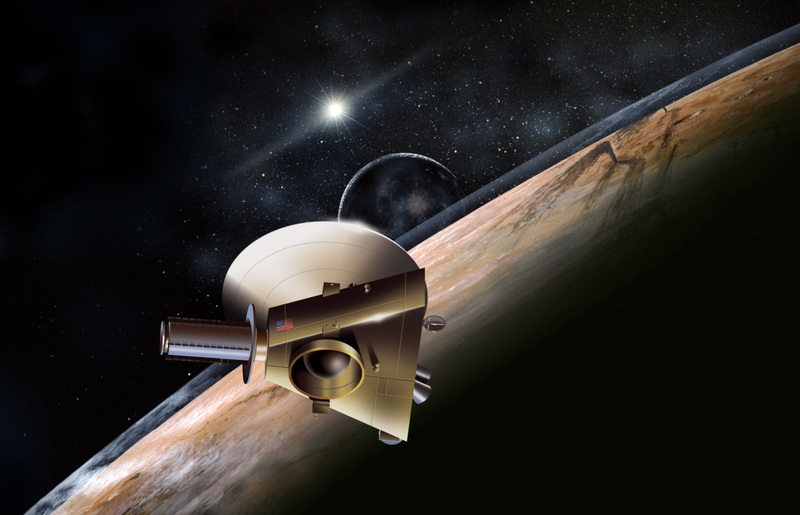 New Horizons made the fastest journey to Pluto, but it’s also going to fly past the planet at 50,000 km/h. That’s less time to take high resolution images. And if you wanted to actually go into orbit around Pluto, you’d need more rockets to lose all that velocity. So how long does it take to get to Pluto? Roughly 9-12 years. You could probably get there faster, but then you’d get less science done, and it probably wouldn’t be worth the rush. Are you super excited about the New Horizons flyby of Pluto? Tell us all about it in the comments below. How far is the Sun? It seems as if one could hardly ask a more straightforward question. Yet this very inquiry bedeviled astronomers for more than two thousand years. Certainly it’s a question of nearly unrivaled importance, overshadowed in history perhaps only by the search for the size and mass of the Earth. Known today as the astronomical unit, the distance serves as our reference within the solar system and the baseline for measuring all distances in the Universe. The Orbit of Earth. How Long is a Year on Earth? Ever since the 16th century when Nicolaus Copernicus demonstrated that the Earth revolved around in the Sun, scientists have worked tirelessly to understand the relationship in mathematical terms. If this bright celestial body – upon which depends the seasons, the diurnal cycle, and all life on Earth – does not revolve around us, then what exactly is the nature of our orbit around it? For several centuries, astronomers have applied the scientific method to answer this question, and have determined that the Earth’s orbit around the Sun has many fascinating characteristics. And what they have found has helped us to understanding why we measure time the way we do. First of all, the speed of the Earth’s orbit around the Sun is 108,000 km/h, which means that our planet travels 940 million km during a single orbit. The Earth completes one orbit every 365.242199 mean solar days, a fact which goes a long way towards explaining why need an extra calendar day every four years (aka. during a leap year). The planet’s distance from the Sun varies as it orbits. In fact, the Earth is never the same distance from the Sun from day to day. When the Earth is closest to the Sun, it is said to be at perihelion. This occurs around January 3rd each year, when the Earth is at a distance of about 147,098,074 km. The average distance of the Earth from the Sun is about 149.6 million km, which is also referred to as one astronomical unit (AU). When it is at its farthest distance from the Sun, Earth is said to be at aphelion – which happens around July 4th where the Earth reaches a distance of about 152,097,701 km. And those of you in the northern hemisphere will notice that “warm” or “cold” weather does not coincide with how close the Earth is to the Sun. That is determined by axial tilt (see below). Next, there is the nature of the Earth’s orbit. Rather than being a perfect circle, the Earth moves around the Sun in an extended circular or oval pattern. This is what is known as an “elliptical” orbit. This orbital pattern was first described by Johannes Kepler, a German mathematician and astronomer, in his seminal work Astronomia nova (New Astronomy). After measuring the orbits of the Earth and Mars, he noticed that at times, the orbits of both planets appeared to be speeding up or slowing down. This coincided directly with the planets’ aphelion and perihelion, meaning that the planets’ distance from the Sun bore a direct relationship to the speed of their orbits. It also meant that both Earth and Mars did not orbit the Sun in perfectly circular patterns. In describing the nature of elliptical orbits, scientists use a factor known as “eccentricity”, which is expressed in the form of a number between zero and one. If a planet’s eccentricity is close to zero, then the ellipse is nearly a circle. If it is close to one, the ellipse is long and slender. Earth’s orbit has an eccentricity of less than 0.02, which means that it is very close to being circular. That is why the difference between the Earth’s distance from the Sun at perihelion and aphelion is very little – less than 5 million km. Third, there is the role Earth’s orbit plays in the seasons, which we referred to above. The four seasons are determined by the fact that the Earth is tilted 23.4° on its vertical axis, which is referred to as “axial tilt.” This quirk in our orbit determines the solstices – the point in the orbit of maximum axial tilt toward or away from the Sun – and the equinoxes, when the direction of the tilt and the direction to the Sun are perpendicular. In short, when the northern hemisphere is tilted away from the Sun, it experiences winter while the southern hemisphere experiences summer. Six months later, when the northern hemisphere is tilted towards the Sun, the seasonal order is reversed. In the northern hemisphere, winter solstice occurs around December 21st, summer solstice is near June 21st, spring equinox is around March 20th and autumnal equinox is about September 23rd. The axial tilt in the southern hemisphere is exactly the opposite of the direction in the northern hemisphere. Thus the seasonal effects in the south are reversed. While it is true that Earth does have a perihelion, or point at which it is closest to the sun, and an aphelion, its farthest point from the Sun, the difference between these distances is too minimal to have any significant impact on the Earth’s seasons and climate. Another interesting characteristic of the Earth’s orbit around the Sun has to do with Lagrange Points. These are the five positions in Earth’s orbital configuration around the Sun where where the combined gravitational pull of the Earth and the Sun provides precisely the centripetal force required to orbit with them. The five Lagrange Points between the Earth are labelled (somewhat unimaginatively) L1 to L5. L1, L2, and L3 sit along a straight line that goes through the Earth and Sun. L1 sits between them, L3 is on the opposite side of the Sun from the Earth, and L2 is on the opposite side of the Earth from L1. These three Lagrange points are unstable, which means that a satellite placed at any one of them will move off course if disturbed in the slightest. The L4 and L5 points lie at the tips of the two equilateral triangles where the Sun and Earth constitute the two lower points. These points liem along along Earth’s orbit, with L4 60° behind it and L5 60° ahead. These two Lagrange Points are stable, hence why they are popular destinations for satellites and space telescopes. The study of Earth’s orbit around the Sun has taught scientists much about other planets as well. Knowing where a planet sits in relation to its parent star, its orbital period, its axial tilt, and a host of other factors are all central to determining whether or not life may exist on one, and whether or not human beings could one day live there. We have written many interesting articles about the Earth’s orbit here at Universe Today. Here’s 10 Interesting Facts About Earth, How Far is Earth from the Sun?, What is the Rotation of the Earth?, Why are there Seasons?, and What is Earth’s Axial Tilt? For more information, check out this article on NASA- Window’s to the Universe article on elliptical orbits or check out NASA’s Earth: Overview. Astronomy Cast also espidoes that are relevant to the subject. Here’s BQuestions Show: Black black holes, Unbalancing the Earth, and Space Pollution. Encke reached the perihelion of its 3.3-year-long orbit on Nov. 21; newcomer ISON will arrive at its on Nov. 28. While it seems to be holding together quite well in these STEREO images, what happens when it comes within 730,000 miles of the Sun next week is still anybody’s guess. Read more: Whoa, Take a Look at Comet ISON Now! It’s not much to look at, but there it is: the incoming comet ISON (aka C/2012 S1) as seen by the HiRISE camera aboard NASA’s Mars Reconnaissance Orbiter. An enlarged version of one of four just-released images, this represents a 256-by-256-pixel patch of sky imaged by HiRISE on Sunday, September 29. ISON is the fuzzy blob at center, 8.5 million miles (13.8 million km) away. Based on preliminary analysis of the data, the comet appears to be at the low end of the range of brightness predictions for the observation. As a result, the image isn’t visually pleasing but low coma activity is best for constraining the size of the nucleus. This image has a scale of approximately 8 miles (13.3 km) per pixel, larger than the comet, but the size of the nucleus can be estimated based on the typical brightness of other comet nuclei. The comet, like Mars, is currently 241 million kilometers from the Sun. As the comet gets closer to the sun, its brightness will increase to Earth-based observers and the comet may also become intrinsically brighter as the stronger sunlight volatilizes the comet’s ices. More images of ISON from HiRISE are expected as the comet came even closer to Mars, approaching within 6.7 million miles (10.8 million km), but the illumination from those angles may not be as good. Comet ISON will make its closest pass of the Sun (perihelion) on November 28, 2013, coming within 724,000 miles (1.16 million km) before heading back out into the Solar System… if it survives the encounter, that is. Read more about how to view ISON here and here. Worried about ISON’s first (and possibly last) visit to the inner Solar System? Don’t be. Recent rumors of comet-caused catastrophe are greatly exaggerated… read more on David Dickinson’s article Debunking Comet ISON Conspiracy Theories (No, ISON is Not Nibiru). Move over Comet ISON. You’ve got company. Australian amateur astronomer Terry Lovejoy, discoverer of three previous comets, including the famous, long-tailed sungrazer C/2011 W3 (Lovejoy), just added a 4th to his tally. This new comet will add to a lineup of comets that should grace early November skies in the northern hemisphere: Comets ISON, Encke and now the new Lovejoy. The discovery of C/2013 R1 Lovejoy was announced on Sept. 9 after two nights of photographic observations by Lovejoy with an 8-inch (20 cm) Schmidt-Cassegrain reflector. When nabbed, the comet was a faint midge of about 14.5 magnitude crossing the border between Orion and Monoceros. Subsequent observations by other amateur astronomers peg it a bit brighter at 14.0 with a small, condensed coma. Right now you’ll need a hefty telescope to catch a glimpse of Lovejoy’s latest, but come November the comet will glow at around 8th magnitude, making it a perfect target for smaller telescopes. At closest approach on the Nov. 23, Lovejoy will pass 38.1 million miles (61.3 million km) from Earth while sailing across the Big Dipper at a quick pace. Mid to late November is also the time when Comet ISON, the current focus of much professional and amateur observation, will be at its brightest in the morning sky at around magnitude 2-3. Get ready for some busy nights at the telescope! C/2013 R1 will whip by the sun on Christmas Day at a distance of 81 million miles (130.3 million km) and then return back to the deeps from whence it came. The charts here give you a general idea of its location and path over the next couple months. As the comet crosses into small-scope territory in early November, I’ll provide maps for you to find it. A graphic created by Stuart Atkinson showing the comet and planetary lineup that should be in the skies on November 9, 2013. And as Stuart Atkinson noted on his website, Cumbrian Sky a great lineup should be in the northern hemisphere skies on November 9, 2013. From the left, Comet Encke will be magnitude 6, ISON should be at about magnitude 6 or 7; then Mars, followed by the new Comet Lovejoy, which will be still very faint at around magnitude 9, topped off by a bright Jupiter. The comets will not likely be of naked eye visibility, but this should be a great chance for astrophotographer to capture this lineup! Welcome to an exciting time for comet lovers, and congratulations Terry on another great discovery! This 4th of July weekend brings us one more reason to celebrate. On July 5th at approximately 11:00 AM EDT/15:00 UT, our fair planet Earth reaches aphelion, or its farthest point from the Sun at 1.0167 Astronomical Units (A.U.s) or 152,096,000 kilometres distant. Though it may not seem it to northern hemisphere residents sizzling in the summer heat, we’re currently 3.3% farther from the Sun than our 147,098,290 kilometre (0.9833 A.U.) approach made in early January. We thought it would be a fun project to capture this change. A common cry heard from denier circles as to scientific facts is “yeah, but have you ever SEEN it?” and in the case of the variation in distance between the Sun and the Earth from aphelion to perihelion, we can report that we have! We typically observe the Sun in white light and hydrogen alpha using a standard rig and a Coronado Personal Solar Telescope on every clear day. We have two filtered rigs for white light- a glass Orion filter for our 8-inch Schmidt-Cassegrain, and a homemade Baader solar filter for our DSLR. We prefer the DSLR rig for ease of deployment. We’ve described in a previous post how to make a safe and effective solar observing rig using Baader solar film. Our primary solar imaging rig. A Nikon D60 DSLR with a 400mm lens + a 2x teleconverter and Baader solar filter. Very easy to employ! We’ve been imaging the Sun daily for a few years as part of our effort to make a home-brewed “solar rotation and activity movie” of the entire solar cycle. We recently realized that we’ve imaged Sol very near aphelion and perihelion on previous years with this same fixed rig, and decided to check and see if we caught the apparent size variation of our nearest star. And sure enough, comparing the sizes of the two disks revealed a tiny but consistent variation. It’s a common misconception that the seasons are due to our distance from the Sun. The insolation due to the 23.4° tilt of the rotational axis of the Earth is the dominant driving factor behind the seasons. (Don’t they still teach this in grade school? You’d be surprised at the things I’ve heard!) In the current epoch, a January perihelion and a July aphelion results in milder climatic summers in the northern hemisphere and more severe summers in the southern. The current difference in solar isolation between hemispheres due to eccentricity of Earth’s orbit is 6.8%. The orbital eccentricity of the Earth also oscillates over a 413,000 year period between 5.8% (about the same as Saturn) down to 0.5%. We’re currently at the low end of the scale, just below the mean value of 2.8%. Variation in eccentricity is also coupled with other factors, such as the change in axial obliquity the precession of the line of apsides and the equinoxes to result in what are known as Milankovitch cycles. These variations in extremes play a role in the riddle of climate over hundreds of thousands of years. Climate change deniers like to point out that there are large natural cycles in the records, and they’re right – but in the wrong direction. Note that looking solely at variations in the climate due to Milankovitch cycles, we should be in a cooling trend right now. Against this backdrop, the signal of anthropogenic climate forcing and global dimming of albedo (which also masks warming via cloud cover and reflectivity) becomes even more ominous. Aphelion can presently fall between July 2nd at 20:00 UT (as it did last in 1960) and July 7th at 00:00 UT as it last did on 2007. The seemingly random variation is due to the position of the Earth with respect to the barycenter of the Earth-Moon system near the time of aphelion. The once every four year reset of the leap year (with the exception of the year 2000!) also plays a lesser role. Perihelion and aphelion vs the solstices and equinoxes, an exaggerated view. (Wikimedia Commons image under a 3.0 Unported Attribution-Share Alike license. Author Gothika/Doudoudou). We’re also approaching the solar maximum through the 2013-2014 time frame, another reason to break out those solar scopes. This current Solar Cycle #24 has been off to a sputtering start, with the Sun active one week, and quiet the next. The last 2009 minimum was the quietest in a century, and there’s speculation that Cycle #25 may be missing all together. And yes, the Moon also varies in its apparent size throughout its orbit as well, as hyped during last month’s perigee or Super Moon. Keep those posts handy- we’ve got one more Super Moon to endure this month on July 22nd. The New Moon on July 8th at 7:15UT/3:15 AM EDT will occur just 30 hours after apogee, and will hence be the “smallest New Moon” of 2013, with a lot less fanfare. Observers worldwide also have a shot at catching the slender crescent Moon on the evening of July 9th. This lunation and the sighting of the crescent Moon also marks the start of the month of Ramadan on the Muslim calendar. Could a new trend be afoot? A fine apparition of the planet Mercury graces the dawn skies this week, leading up to its greatest elongation from the Sun for 2013. It seems that nearly every appearance of the planet Mercury is touted as the “best” these days. Such was the case with the inner-most world’s dusk showing early last month. Truth is, all elongations of Mercury (and Venus, for that matter) are not created equal, and visibility of each apparition isn’t the same for observers worldwide. We’ll show you why. Mercury orbits the Sun once every 88 days. With an orbit interior to our own, it never strays far from the Sun in the sky and thus can only appear low in the dawn or dusk. Its orbit is also elliptical, with an eccentricity of 0.206, the greatest of any planet in our solar system. This means that greatest elongations can vary considerably, from 17.9° away from the Sun in the sky near perihelion of the planet to 28.7° near aphelion. And although reaching greatest elongation near aphelion means the tiny world is above the muck of the horizon, it also means it’s also intrinsically a bit fainter; Mercury can vary in brightness from magnitude -0.2 at a perihelic-elongation to half a magnitude fainter at +0.3 for an aphelic-elongation. A comparison of elongations of Mercury as seen from the Earth at perihelion versus aphelion. (Created by the author). But there’s more. Compounding this situation is the angle of the ecliptic, or the imaginary plane of the orbit of the Earth. Near the March equinox the ecliptic rides high in the dusk to the west and low in the dawn to the east for northern hemisphere observers. In the southern hemisphere, the reverse is true. It’s a strange sight for a northerner to head “Down Under” and watch the Sun rise in the east, transit to the north and set to the west! The path of Mercury looking east ~45 minutes prior to sunrise from latitude 30 degrees north from March 26th through April 30th, (Created by the author using Starry Night). Thus what may be a terrible apparition of Mercury for one hemisphere may be a grand one for another, as is the case this week. Yes, northern observers can catch the fleeting world, if they know exactly where to look for it. For observers based at longitude 40° north, Mercury will never peak above an altitude of 10° in the dawn sky. Observers based near 35° south will however see the planet reach its maximum possible elevation of over 25° degrees above the horizon. We would qualify this as “The best dawn appearance of Mercury for 2013… as seen from the southern hemisphere.” Greatest elongations of Mercury occur in pairs, with dusk-to-dawn apparitions about 45 days apart as the planet passes between us and the Sun, followed by a longer period of about 70 days as the world loops back around behind the Sun. The orbit of Mercury is tilted about 7° with respect to our own. Otherwise, we would see a transit of the planet every inferior conjunction, as last occurred on November 8th, 2006 and will happen next on May 9th, 2016. The path of Mercury from March 26th through April 26th looking east from latitude 35 degrees south ~45 minutes prior to sunrise. (Created by the author using Starry Night). Mercury will show a maximum illumination area of 38.5” square arc seconds as seen from the Earth March 30th on just before reaching its greatest elongation west of the Sun on March 31st on Easter Day at 22:00 UT/18:00EDT. Through a telescope, Mercury will display a 7.7” diameter disk with a 50% illuminated “half-Moon” phase. Mercury reaches greatest elongation just 28 hours prior to aphelion which occurs on April 2nd, the closest this has occurred date-wise since April 8th, 2006. This won’t be matched again until March 24th, 2020. Shining at magnitude +0.3, Mercury will then race ahead of the Earth on its inside track and will begin to gradually sink lower on successive mornings in early April. The morning of April 8th may well offer the last good chance to spy the tiny world when the old crescent Moon passes just 8° degrees north of the planet within two days of reaching New phase on April 10th. Mercury reaches superior conjunction opposite to the Earth and on the far side of the Sun on May 11th, 2013, and will again head into the dusk skies for its next greatest eastern elongation on June 12th. From our Earthly vantage point, Mercury completes 3.15 orbits of the Sun a year. This means that we see 6 greatest elongations on average most years, 3 westerns (dawn) and 3 easterns (dusk). The most elongations of Mercury that you can have in a calendar year are 7, which occurred in 2011 and will happen again in 2015. It’s fascinating to think that until the advent of the Space Age, the orbit and the rough size of Mercury was all we knew about the planet. It would take the first flyby of the Mariner 10 spacecraft to give us a close up view of Mercury in 1974. The precession of the orbit of Mercury was a mystery until explained by Einsteinian physics, and still stands as one of the great proofs of general relativity. Today, we have a permanent ambassador around Mercury, NASA’s MESSENGER spacecraft. MESSENGER has mapped to world in detail, sampled its tenuous exosphere, and observed hints of ancient volcanic activity. MESSENGER will be followed by the joint European Space Agency/Japan Aerospace Exploration Agency mission BepiColombo set to launch in 2015 which will arrive at Mercury in 2022. All fascinating things to ponder as you search for the diminutive world low in the dawn skies this coming Easter weekend!